Please contact the artist to order these fundraiser cards. 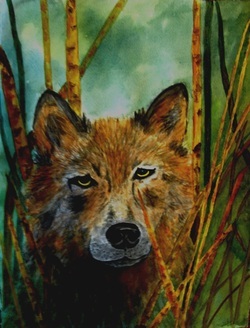 All proceeds from the card sales go to the Akita Club of Alberta Rescue Fund, helping Akitas find their forever homes. Recently, in the spring 2011 we took in 8 adult Akitas removed from a neglectful home. We still have 2 of those females looking for loving homes. In a few weeks, the Akita Club of Alberta will be receiving 5 young puppies who will also require experienced family homes. Please visit the site to get more info. A simple line drawing created by Kay McCormack for a Thank You card to all our donors to the Akita Club of Alberta Rescue Fund. Can be purchased in packages of 5, 4 x 6" size printed on cream coloured card stock for $10.00/pkg. 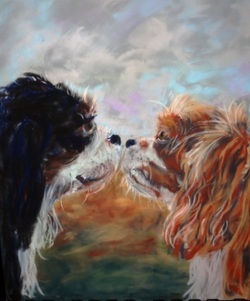 A pastel of Kay's current pets "Charlie and Abby". They are Cavalier King Charles spaniels. The photo was taken by Hayley McCormack, Kay's daughter when the dogs were cavorting around the field at home. This image is printed on white cards, pkg of 5 for $10.00 4x6" size.